No Irish event of such consequence is more powerfully symbolised by a single object than the 1798 insurrection and the pike. 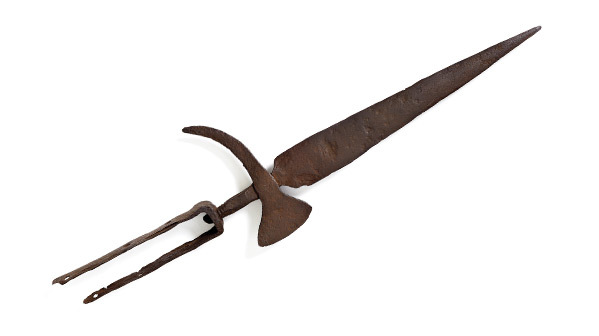 Pikes were a standard weapon of mediaeval and early modern armies, but by the eighteenth century they were much more strongly associated with revolutionary violence. So symbolic of popular insurrection has the weapon become that it is generally forgotten that crown forces in Ireland in 1798 also used pikes. The first seizure of hidden pikes was in Dublin in 1793. Four years later the directory of the Society of United Irishmen ordered all members who could not afford firearms to equip themselves with pikes. More than 70,000 were found in government searches in Leinster and Ulster in 1797 alone. When fighting finally began, charges by massed ranks of pike-wielding men were the main rebel tactic. Jonah Barrington, an independent observer, noted ‘the extreme expertise with which the Irish handled the pike’. Even this expertise was seldom sufficient for very long against trained troops. The United Irishmen, founded in Belfast in October 1791, aimed, as one of its leaders, Theobald Wolfe Tone, put it, to ‘comprehensively embrace Irishmen of all denominations’ in the cause of democratic reform and ‘national government’. Its initial methods were constitutional, but after Britain declared war on revolutionary France in 1793, demands for peaceful reform were increasingly met with frustration and repression, culminating in the banning of the United Irishmen. Campaigns for reform turned to dreams of revolution. Tone and other leaders went to Paris to lobby the revolutionary government for support. A French invasion fleet of 43 ships set sail for Bantry Bay in December 1796 but was driven back by gales. Thereafter, the government launched a ferocious campaign of repression, aimed at disarming the would-be rebels. Through house-burnings, floggings, executions and torture, it smashed the United Irish organisation in Ulster, which had deep support among Presbyterians. While Tone waited for another French invasion, the United Irish at home planned to go ahead with a rebellion, which took hold mostly in Wexford and Wicklow. By the end of May 1798 the rebels had taken Wexford town and Enniscorthy. They were driven back from New Ross on 4 June, however, and crushed at Vinegar Hill above Enniscorthy on 21 June. A belated rising in Ulster, beginning in Antrim on 7 June and partly led by young Belfast cotton-maker Henry Joy McCracken, had also been defeated. By the time a small French force under General Jean-Joseph Humbert arrived at Killala Bay, in Mayo, on 22 August, it was no more than a bloody coda to one of the bloodiest episodes in Irish history. When Tone, captured on a French ship, took his own life, he was one of perhaps 30,000 who had died violently since May. The United Irishmen’s hope for a nonsectarian Irish democracy was drowned in this bloodshed; the conflict ultimately reinforced sectarian divisions by shattering Presbyterian radicalism. The idea of ‘the pike in the thatch’ retained its romantic appeal, but 1798 changed Ireland for good: the revolutionaries’ ideal of unity became an ever more distant dream.